Delhi Panchavadyam Trust, a non-profit organization promoting Temple Arts of Kerala based in Delhi is organizing a Pooram (traditional temple festival of Kerala) in Dilshad Garden, Delhi from 16th to 17th Feb 2019, which will be in line with the Trichur Pooram in Kerala. 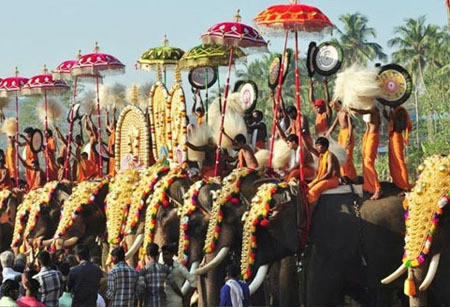 The highlight of the event would be from 1430 hrs on 17th Feb onwards wherein a grand procession with 3 Caparisoned Elephants with traditional Kerala Instrumental Music and Folklore would commence. Our Hon. Minister of State-Tourism, Mr. Alphons Kannanthanam and Mr. Manish Sisodia, Dy. Chief Minister of Delhi would be inaugurating the Pooram Procession on 17th Feb. There is no entrance of ticket charges for the visitors and sufficient security cover is sought from Delhi Police to ensure visitors would enjoy the event.